This book is a list of 49 science related jobs that allow students in grades 9 through 12 an opportunity to explore careers that they might not otherwise have thought of exploring. The book lists these jobs and then devotes two to four pages describing what the person does in their job, providing advice from the person who works at that job, as well as describing typical days, scariest experiences, and things the person likes about their job. This book could be used by the teacher as a way of introducing a topic or peaking students interest before beginning a lesson in many different areas. This book could also be used by students who are looking for what interests them in the world as they prepare for college or to get a job after graduation. The book is arranged in an easy to read format and provides brief, but descriptive real-life examples of jobs and what a person doing these jobs would do on a day to day basis. An advice section is included for each job which is directed towards high school students. This advice, coming directly from someone in the field, tells students what they should be doing in high school and college if they are interested in this field. This book is well put together and offers many different opportunities and ideas to young people looking to go into the work place. Readers will appreciate it’s layout and informative text. I think this book would be a great tool for both teachers and students. It is extremely well laid out and easy to read. It offers a brief yet descriptive view of many different careers. Thinking about what you want to do for a career as an 18 year-old can be a daunting task. 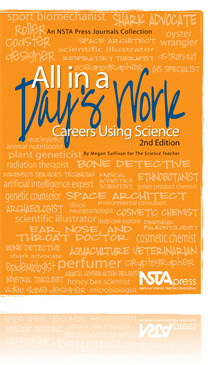 This book helps bring a real-world look at some jobs related to science. Some of these jobs you would expect to be included in a book like this (science teacher, biologist, veterinarian) and others you might not have thought of (oyster wrangler, musical acoustic scientist). This book opens doors for students that have an interest in science but aren’t sure how that can relate to a job after graduation.